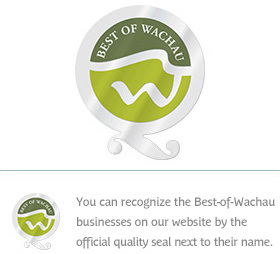 Certified “Best-of-Wachau” businesses have been ensuring top enjoyment from regionally typical lodgings, food and drink since 2012. They consider themselves the flagships of the region and stand for excellent quality that visitors can see and taste. This quality label is awarded only to businesses that meet strict criteria in terms of ambience and that take a highly cultivated approach to fine wining and dining. Members agree to preserve traditions and aspects of cultural identity that have evolved historically. Yet they are also innovative in further developing their own products and services to provide even greater quality and comfort. Best-of-Wachau hosts offer excellent quality and an authentic Wachau experience. Their cuisine relies on homemade specialties coupled with regional products and close ties to food producers in the area. You can look forward to the nicest hotels, comfortable rooms in private homes, relaxing holidays on a farm or winery and to award-winning gourmet cuisine as well as the traditional, down-to-earth fare of country inns. The Best of Wachau hosts have even more to offer you: The Best of Wachau Goldclub! Take some time out and spend three or more nights at a Best of Wachau establishment from May to October. You will be rewarded with exclusive benefits to make your stay or vacation in Austria an unforgettable experience. Look forward to exclusive benefits, enjoy wonderful Goldclub bonus services and the attractive direct booker bonus. Don't miss enjoying exclusive benefits from 3 nights onwards! All offers and details are available for download in the Best of Wachau Goldclub folder.